The Queensland branch held its last planning meeting for 2008 at the SAAA hall at Archerfield Aerodrome on Tuesday, 18th November 2008 which was attended by Phillip Audsley, Des Goss, Arthur Stead and Steven Odgaard. Cruise report - Muriel Street, Redland Bay, Sunday 9th November 2008. Peter Venn, Des Goss & Steven Odgaard in the Turbo TP6 and Arthur Stead in his Revtech Renegade ventured out in blustery overcast conditions punching their way south towards Mosquito Island in the grunty 4 stroke powered craft, with only low tide and narrow channels between stands of mangroves to aid our safe passage. 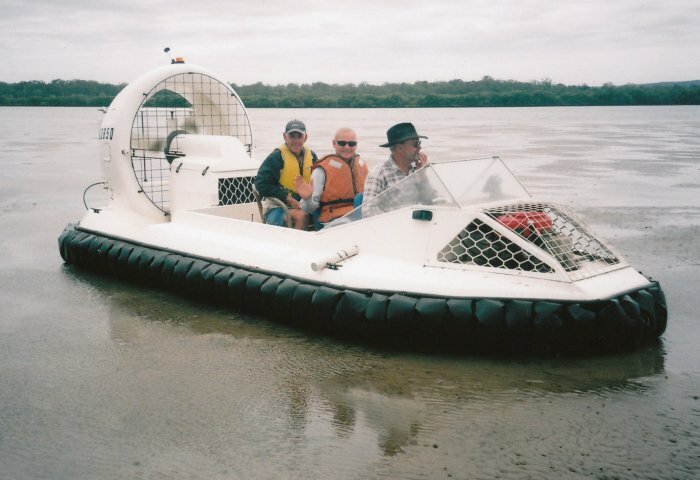 After a brief pause on a sandbank south of Russell Island, Des, Peter and Steve noticed that Arthur was busy putting bungs into his rear engine compartment. Good idea Arthur - but you probably should have put them in before leaving Redland Bay. On entering Mosquito passage Arthur stopped to see why a big burly bloke was doing the Australian crawl. This unfortunate jet ski user tried to manoeuvre in very shallow water but had run aground and became somewhat stranded when his personal water craft caused him to take a personal mud bath. He had been struggling for some time to push his jet ski back to deep water but the tide receded very quickly and left him exhausted and exposed. 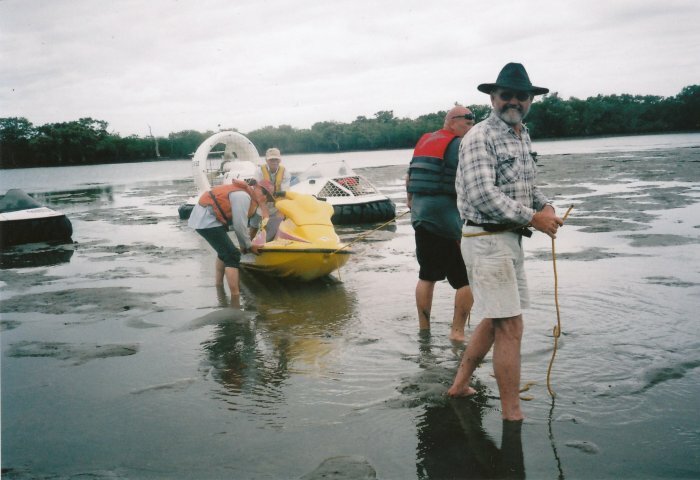 Des, Peter, Arthur and I heaved on each corner of the stranded scooter and assisted in moving the jet-ski until the thin sandy crust yielded to a soft muddy slop. 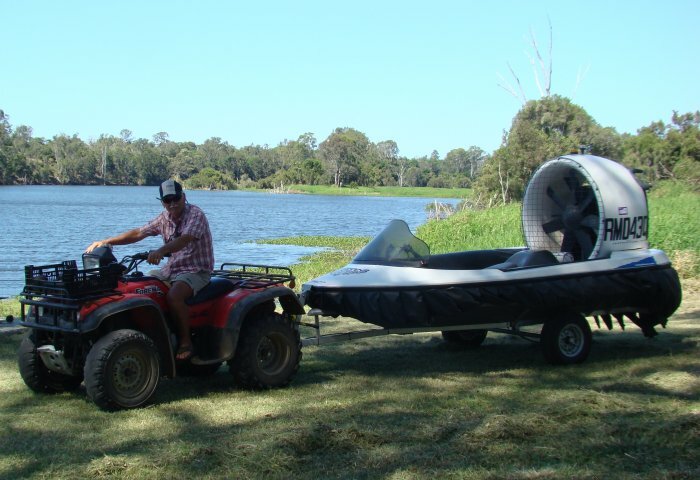 The poor guy was ready to give up and laid there exhausted until we tied a tow rope behind the Turbo TP6 and managed to slide the jet-ski across the greasy brown surface to deep water some 200 metres away. 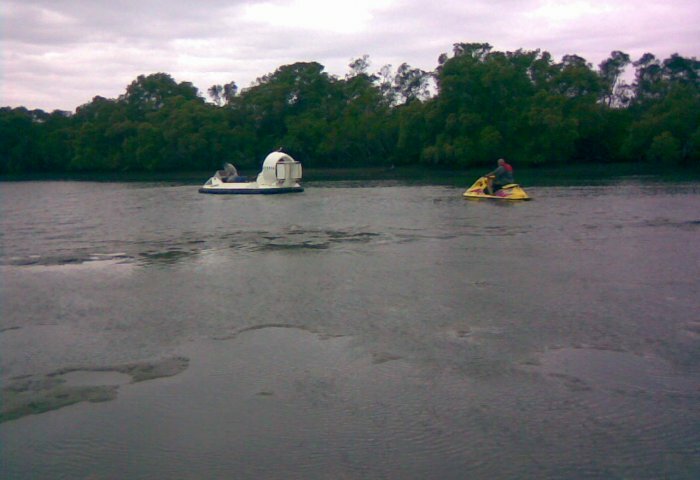 Another jet ski arrived and towed the stricken craft back to Cabbage Tree Point. With the excitement over, we continued along the thin winding Mosquito Passage, then headed east out into Jumpinpin waterways and settled on Stradbroke Island at the ever popular Slipping Sands. A boating enthusiast and his family of kids who had also ventured out in the miserable weather came over to look at the Turbo TP6 and the Revtech Renegade, and commented that they had seen us landing on the beach but did not hear us coming. Arthur Stead and Steven Odgaard climbed to the top of the slipping sands and enjoyed the view. Steven descended the sand dune very slowly with the aid of a borrowed toboggan board. We headed back to Lagoon Passage via Russell Island and cruised comfortably in the exposed bay with a stiff tail wind. Elaine's home cooking was a welcome delight as we enjoyed another tea break with lots of scones, cakes and sandwiches. Peter Venn and Steven Odgaard ended the day with a hovering competition in the hover port shed with some model helicopters. On the previous Friday, Arthur and Judy travelled north with the Renegade in tow and met Barry Fennell at Maryborough. 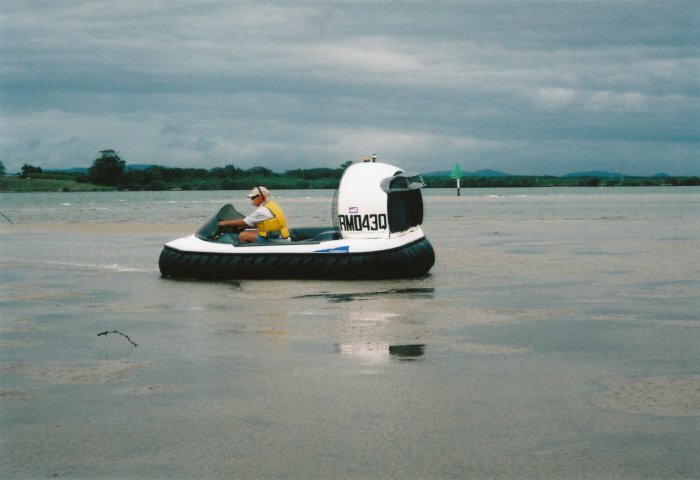 Barry took his Viper 4X out for a cruise with Arthur on the Mary River. 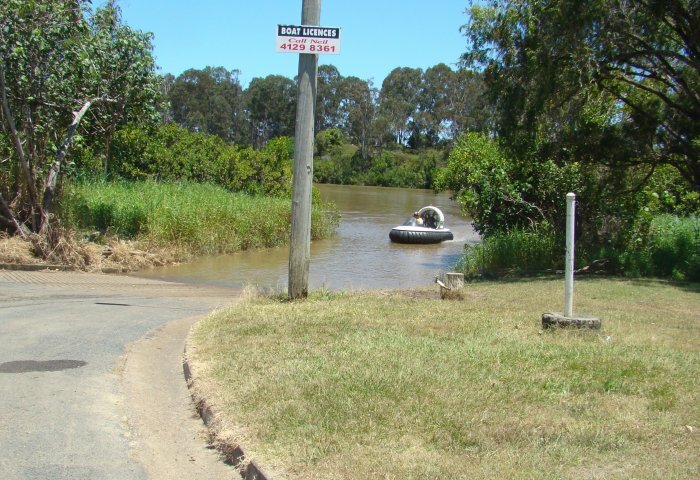 Arthur and Judy then travelled further north to the Gin Gin region for a few days cruising on the fresh waters of the Burnett River upstream of Bundaberg. Angus Kerr has some interesting news from Northern Queensland. I received a phone call from Jack Hickmutt who bought Ray O'Sullivans craft from up north. He lives in Proserpine and is interested in joining the club. If anyone could assist in teaching him to fly this craft, he would probably offer to fly them up there for the weekend. He also has a 36 foot cabin cruiser and would be willing to take them out on it if they can stay longer. I believe he is semi retired, approx 80 years old. His phone number is (07) 4794 51605 and mob 0438 451 605. He would like to hear from anyone in the club. 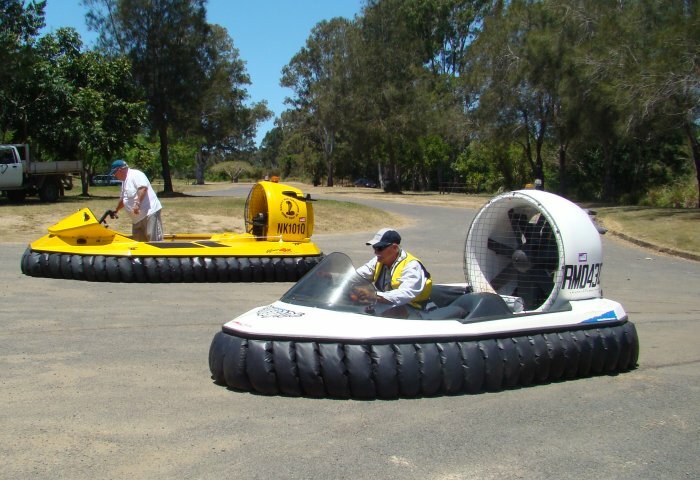 The next club cruise will be held on Saturday 6th December 2008 at Muriel St, Redland Bay. 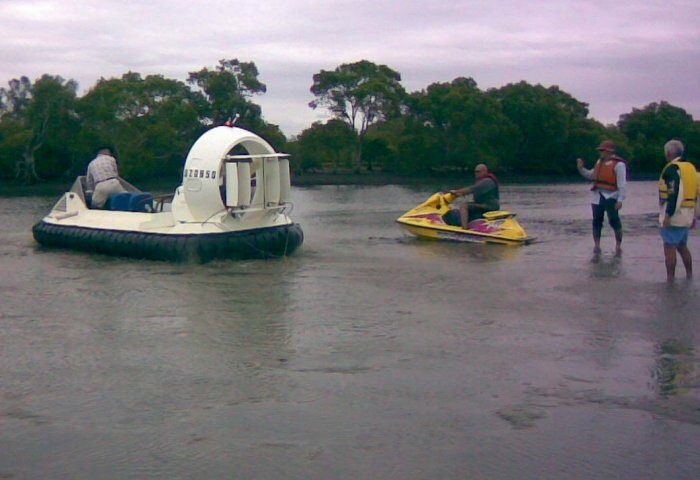 Meet at 9:00 am at Peter Venn's place at 96 Muriel St, Redland Bay for a launch into the Redland Bay Channel - destination to be decided on the day depending on weather conditions. The first club cruise for 2009 will be held on Saturday 17th January 2009 at Muriel St, Redland Bay. 7:30 pm - Tuesday, 20th January 2009.